I was introduced to Dragonfly Expression via a Facebook mention by Bellenza, a wedding ideas site. Chantal Larocque, the French Canadian owner, creates such an enormous variety of pretty paper blooms, it was difficult to choose a favorite. The vivid colors of these rosettes won my heart! Chantal also makes realistic peonies, dahlias, marigolds, daisies, and poppies - all are lovely and surprisingly realistic. Her work has been featured in boutique and store window displays, as wedding bouquets, on place cards, table numbers, favor boxes, and in an Avon catalog, just out this spring. 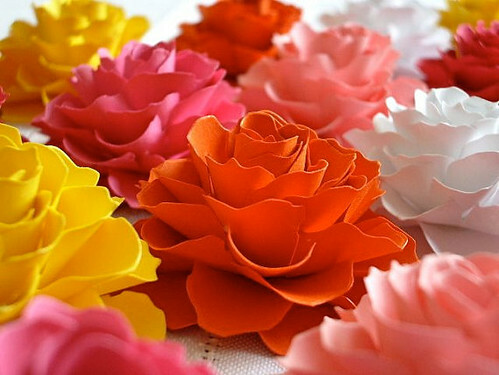 The flowers begin as die cuts, but Chantal often alters them by hand to give each one a unique look. She told me she enjoys design challenges and in fact, her very favorite thing to do is make a client's vision come true. These are gorgeous,I am going to like her facebook page right away. These flowers are amazing! I love the shapes of the petals. And you cannot go wrong with this color combo. Going to check her out! Thank you so much Ann for the feature! I really appreciate! I love this photo of my Rosetta...so cheery! ~~> Thank you everyone for your kind comments about my work! Wow these are so beautiful! Thank you so much for sharing! absolutely delightful; just imagine en-masse .. Thank you for the wonderful creations! So sweet of you to mention Bellenza in this post, and provide a link to us. We're such great admirers of your blog! These flowers are gorgeous. I'm going to have to check out more of Chantal's work.